On the second floor in Fjelstad lies the chalk board displaying pre-med students’ accomplishments. Photo by Maddie Malat. This past summer, students studying health profession around the United States began to submit the primary applications for graduate programs to the American Medical College Application Services; the results of which are now beginning to trickle in. AMCAS opens in May every year, with students typically applying for graduate programs in June. The student’s Medical College Admission Test score, along with the student’s transcript and letters of recommendation, are also sent to AMCAS. AMCAS then takes that information and transmits it to the medical schools that the student is applying for. “It was very strenuous. I started it last June,” said senior Chelsey Petrich, biology major. She said that after you send in your primary AMCAS application, the secondary applications to specific schools need to be submitted. Once those are completed, students begin to receive interviews. According to Dr. Rutherford, the college wrote 59 letters of recommendation for students applying to health professions this past year. However, that number isn’t just limited to 2017’s graduating seniors. Chris Wiger, a senior majoring in biology and Spanish with a minor in chemistry, was one student who decided not to wait. “I’m kind of in the mode of school – of studying and learning. I thought, ‘Well, I enjoy it, so why not? I might as well keep going,’” Wiger said. “I understand why people take gap years. But, it is a long haul, the ‘becoming a doctor’ process.” Wiger has been accepted into the University of Minnesota-Duluth. Petrich explained that one factor in her decision to apply when she did was the supportive staff within the biology department. 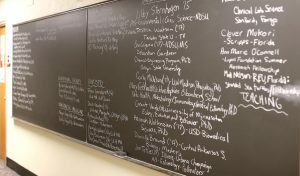 A tangible symbol of the biology department’s dedication to its students is a black chalkboard, currently located on the second floor of Fjelstad: the Med School Board. “[The Med School Board] isn’t just a med school board. It’s where we celebrate the acceptances of students who are pursuing any health profession,” Rutherford said. The board is empty at the beginning of the year, and come April, it’s filled with the names of students finding success, with dates of undergraduate graduations stretching as far back as 2012. “The board is sort of a mix of health professions and bio majors who are going into graduate programs, internships, or teaching,” Rutherford said. Rutherford explained that, even in the age of in Internet, tradition still pulls through. Though at this time of the year it is difficult to nail down what exactly Concordia’s 2017 acceptance rate is, according to Rutherford. She also commented that she is expecting another five to seven other applicants’ approval letters to arrive before the end of May. However, she felt that it was important to note that for the remaining 12 percent, that statistic often doesn’t represent Concordia students who could never make it into the health professions; it more often means that those are students who discovered a different life passion after they graduated. Petrich felt that Concordia has equipped her well for her future at the University of Minnesota-Duluth.